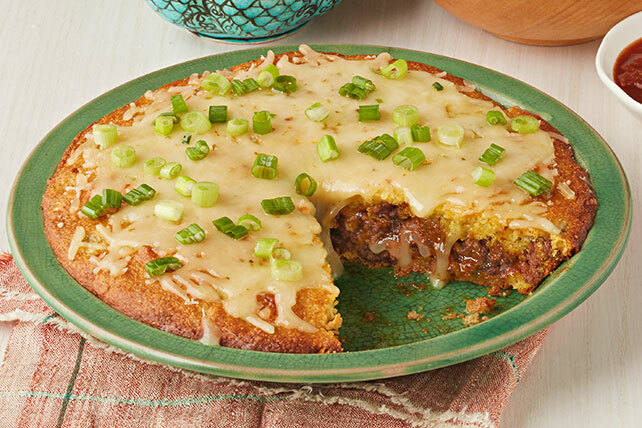 Take a trip to the Southwest with our Tex-Mex Tamale Pie recipe. This savory tamale pie works great topped with lettuce, salsa or sour cream. Mix muffin mix, dressing, chiles and egg just until blended. Spread half the batter onto bottom of 9-inch pie plate sprayed with cooking spray; top with seasoned meat, 1/2 cup cheese and remaining batter. Bake 20 min. Top with remaining cheese and onions; bake 10 min. or until cheese is melted. Top with shredded lettuce, TACO BELL Thick ‘N Chunky Salsa, and BREAKSTONE’S or KNUDSEN Sour Cream before serving. Take time to enjoy your food by eating slowly, and paying attention to how you feel. Recognize when you are no longer hungry and stop eating when you feel satisfied, not full.